The Series 40-A caster with its capacity range and large wheel selection will find applications in factory, commercial and institutional requirements. Design and construction features assure long life. Construction: Heavy gauge steel is cold-forged to provide strong, rigid top plate and cup assembly. Swivel Bearing: Hardened and polished steel balls in coined and hardened upper raceways assure easy swivel action and long service life. Fork: Deep formed legs for strength, welded to cup. King Bolt: Heavy duty steel bolt with threaded lock nut. Axle: Threaded axle bolt locks in place. A hardened and ground sleeve fits over the axle and is held rigid between the legs for exceptional rigidity and strength. Wheels: A full selection of wheels – up to 2-1/2” tread width. Lubrication: Pressure fittings for swivel and wheel bearings. Solid rubber, Bondcelon, and Bondrelene wheels are lubricated through a hollow axle with pressure fitting. AL other wheels lubricate through the hub. Bearing choices: Most wheels are available with tapered roller bearings or precision ball bearings in addition to the plain bore and straight roller bearings offered above - please speak to your representative regarding your application needs. 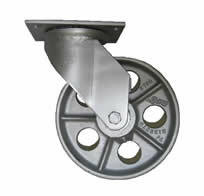 The Series 42-A caster offers a larger top plate (6-1/2" X 5") and slotted bolt holes for two mounting patterns and is recommended for medium duty applications in factories and warehouses. A full range of wheel types offers a choice of floor protective types and long service life. Fork: Legs are formed for strength and continuously welded to the cup. King Bolt: Steel rivet, orbitally formed to provide equal strength at both ends. Lubrication: Readily accessible pressure fittings to swivel assembly and to wheel bearings through wheel hub or hollow axle. Bearings choices: Most wheels are avilable with tapered roller bearings, precision ball bearings, metal and nylon type sleeves - please speak to your representative regarding your application needs. The Series 44-A caster are used in a variety applications in general warehouse trucks, factory trucks, platform trucks and various types of factory-used bins, racks, etc. The Series features a 6-1/2 X 4-1/2” top plate with slotted holes for two mounting patterns. Construction: Heavy gauge steel is cold-forged to provide a strong, rigid top plate and cup assembly. Swivel Bearing: Hardened and polished steel balls in smoothly coined and hardened upper and lower raceways assure easy swivel action and long service life. 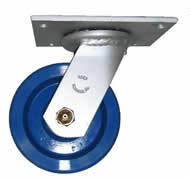 The Series 48-A offers the industry standard mounting plate configuration for medium duty casters. 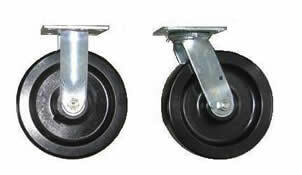 This double ball race caster is recommended for use in variety of portable equipment. They are also excellent for warehouse trucks and dollies, portable racks and shelving, as well as for light duty tow lines. Swivel Bearing: Hardened and polished steel balls in coined and hardened upper and lower raceways assure easy swivel action and long service life. Lubrication: Readily accessible pressure fittings to swivel assembly and to wheel bearing through wheel hub or hollow axle (optional).